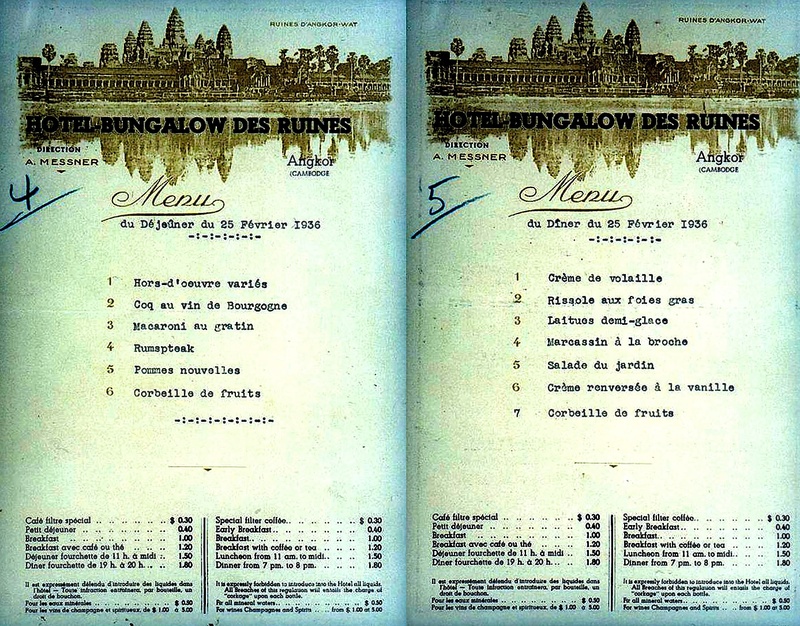 Discovered menus for lunch and dinner served to residents of Hotel-Bungalow des Ruines on the 25 February 1936. The hotel itself opened it door for the first time in the early 1930’s. Located in the heart of Siem Reap town with large lust garden adjacent to the Royal Palace. Now this hotel still maintain it reputation as the most luxurious hotel that offers personalized pampering services for visitors of Ancient Angkor, under the luxury brand ‘Fairmont-Raffles Hotels and Resorts’ – Raffles Grand Hotel d’Angkor! 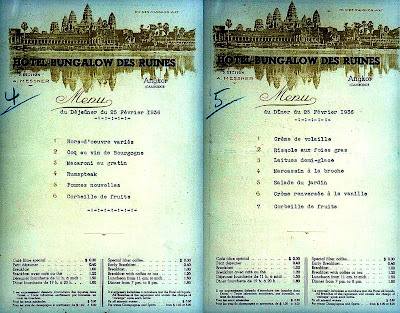 Looking into the menus being served at that time (1936), look very simple, classic and elegant. The sequence of the menu and service might appearance through the simplicity and the amount of the prices. Diner menu is a little bit more expensive $1.80 and served only for 1 hour between 19.00 o’clock – 20.00 o’clock. And also mentioned the person in charge for the hotel that time is A. Messner. From the menu I also notice that pre-printed paper is used and the ‘Chef’s Special Lunch and Diner’ typed with type writer and might they were loosing the number ‘1’ button, that why they used an capital ‘I’ instead. Numbering in front of the dishes is to noted that number of the courses or variety of the food that served. c. Typing error on the ‘Rumspsteak’ 9this is cannot change since they use type writer. d. ‘Au gratin’ means the salamander or oven with top burner was available on that time. e. Rumpsteak is big pieces of mead ‘ either they cooked in a big piece or grilled. In this case grilled or oven presented in that time. f. The last course is simple ‘ whole fruit in the basket’ might to make easier and faster to served. c. Foie gras served in that time; this is might use local duck liver because of the transportation quiet distant from Europe or use goose liver from the tin.